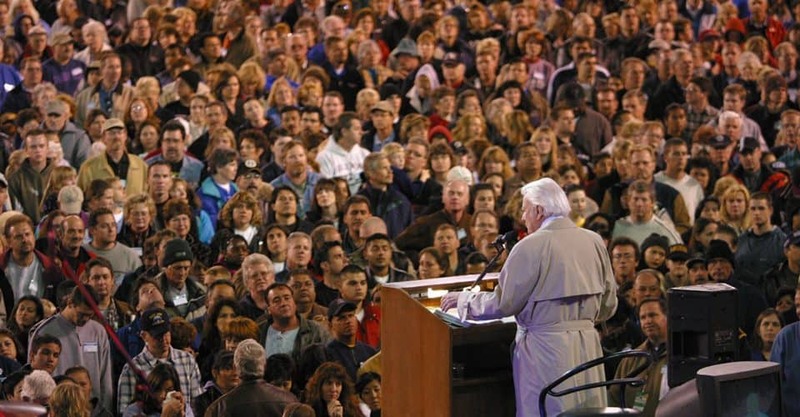 He was Chairman of the “Greater St. Louis Evangelistic Crusade with Billy Graham” in 1999. Cass Banking Systems President and CEO (at the time), Larry Collett recalls many treasured memories of his special times with the late Billy Graham. Upon each visit of the Billy Graham Crusade team to an area, local spiritual leaders select a Chairman from the community with a good name and high degree of integrity and leadership. Larry Collett was the right choice! In every way he was the right man. At a time of general racial tensions, Larry and Cass were a part of the advancing solutions rather than being a part of the problem. Several times, for instance, the bank financed busses filled with pastors, providing free transportation to Promise Keepers stadium events in other cities. They were a good mix of mostly black and white pastors. These trips together always resulted in growing and strengthening relationships. In this time of brief radio, Larry Collett tells us of his warm memories of his times with Dr. Billy Graham, allowing him to confirm that Dr. Graham was indeed a warm and sensitive man of God, humble and righteous. On a personal note … a loosely connected story …. It was more than 20 years ago that I was on one of the busses that Cass Bank had hired to take a bus load of pastors to Atlanta — intentionally a mix of blacks and whites — to a large National Promise Keeper event for pastors. On the way, I was stricken with a severe illness. Upon arriving in Atlanta, I first went to the group’s motel as the pastors went to the PK gathering, thinking I might get better and soon would be OK and join them. Not so! I called Joan at our home in St. Louis to report the situation. She immediately called my dear friend from Central High School in Jackson, MS, Felix Snipes and wife Patsy (I was in their wedding) who lived in Atlanta. Felix rushed to my aid took me to a hospital where I spent the next several days. A church flew Joan down who further cared for me. Here is where I am going with this. When we were in high school together in Jackson, Mississippi, Billy Graham and his team came to town to preach a crusade. Felix and I stood side by side in the choir there in Tiger Stadium. During the invitation to receive Christ as Savior by Billy Graham, Felix said: “Harold, come go with me. I want to rededicate my life.” He told me later that was the night he received Christ and was truly born again. After our time in Mississippi College (where my preacher grandfather attended in the early 1900’s), Felix was called into music ministry. Along the way in those early years, he lead music at a Bible Camp in North Mississippi. There he met a young preacher named Charles Stanley, who asked Felix to lead music in evangelistic meeting where Charles would preach. Felix accepted. Fast Forward: Felix, Patsy, and their children moved to Atlanta where he located his ministry headquarters, and joined First Baptist Church of Atlanta. In time he was asked by church leadership to serve on a search committee, seeking a member of the church’s pastoral staff. Charles was serving as pastor of a Florida church for only a relatively short time, but experienced unexplained restlessness. About that time Felix was led of God to call Charles, expressing a desire to recommend him to that ministry need. Charles Stanley was invited by the church to take that ministry position … and he accepted the “call.” So my dear friend, Felix Snipes, now in Heaven with wife Patsy, was the human instrument that brought Charles Stanley to Atlanta … which became a world-wide ministry of radio, television, and writing. Charles and his family, which included Andy Stanley, lived with Felix and Patsy for weeks while the Stanley’s house was under construction. So, again, the young man who came to saving faith in a Billy Graham meeting in Jackson, Mississippi was the human instrument of God to bring Charles Stanley to, in time, become Senior Pastor of the First Baptist Church of Atlanta. This story is not widely known. But I am led to write it as an appendage to this recognition of the outstanding businessman and follower of Jesus, Larry Collett. To hear … “Patsy Snipes; re the death of husband Felix Snipes; their remarkable ministry; Charles Stanley link” … click on … http://haroldhendrick.com/2010/06/17/patsy-snipes-re-the-death-of-husband-felix-snipes-their-remarkable-ministry-charles-stanley-link/.